The Moscow Kremlin is a historic, fortified complex at the heart of Moscow and is the best known of the Russian Kremlins or fortresses. The word kremlin comes from the word krepest, meaning fortress. The existing Kremlin walls and towers were built in the late 15th century, and for centuries, the Moscow Kremlin has been a favorite subject of Russian artists because it was the seat of power for the Tsars and the dictators that followed. 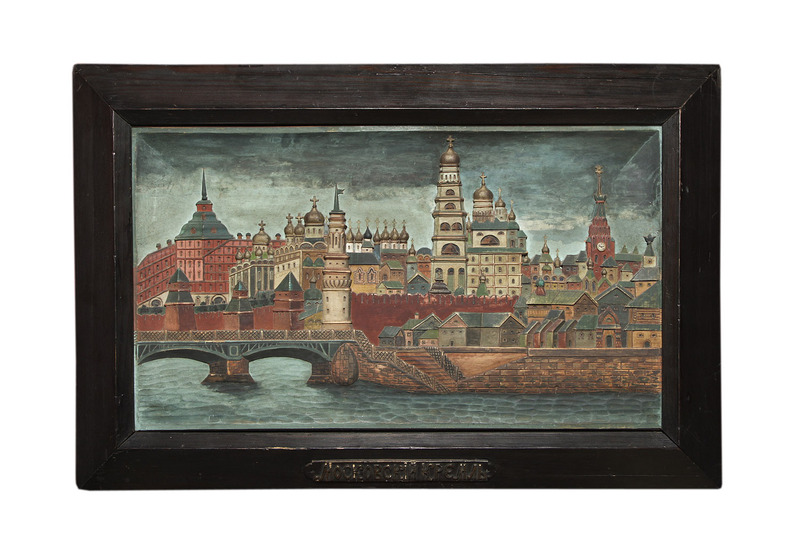 This panoramic view, rendered in rust, deep greens, beige, and burnished gold, is glimpsed over the sea-green Moskva River. This folkloric carving features gold, onion-domed churches as well as the Ivan the GreatBellTower. The Tower marks the exact center of Moscow and is said to resemble a burning candle. Completed in 1600, it stands 81 meters high, and until the Russian Revolution, was the tallest structure in the city. Its 21 bells would sound the alarm if an enemy was approaching. Also of note is the Spasskaya Tower, the main tower with its telltale clock, known as the Kremlin clock, which has been in place since at least the late 16th century. The Tower’s stylized double-headed eagle finial places this carving in the Tsarist era of the late 19th or early 20th century. 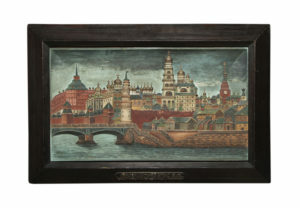 The carving is in its original frame and Cyrillic picture plaque identifying the scene as the Moscow Kremlin. In the nineteenth century, romantic nationalism swept across many European countries. Given this trend, it is only fitting that a work of Russian Folk Art would choose an iconic Russian landmark as its subject.